A 7.5 tonne Mercedes Atego recovery truck. Features include a full tilt and slide bed which makes recovery easy alongside it's 5 tonne, automatic, wireless winching system. 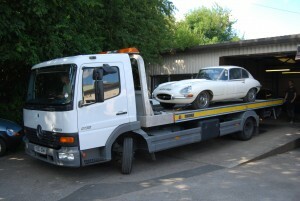 A 3.5 tonne Mercedes Sprinter recovery truck. Features include a fully aluminium body with beaver tail ramps alongside it's very economical Mercedes power unit which allows us to offer nationwide recovery or delivery from just £1 a mile + VAT. A twin axel Jameson trailer. Features including a fully galvanised chassis and body along with beaver tail ramps make for cheap and easy local recovery or delivery. Contact Scotton Garage for more info! Simon York (Managing director and founder of Simon York Car Sales) also owns Scotton Garage Ltd., an independent garage and a DVSA verified MOT testing centre based on the same site as SYCS in Lingerfield, near Knaresborough, North Yorkshire. Having such a facility enables us to fully inspect all of our sales vehicles giving you the upmost confidence in both ourselves and our vehicles. It is possible to view our sales vehicles on the MOT ramps in the workshop if you wish although this may need to be arranged prior to your appointment to ensure availability. 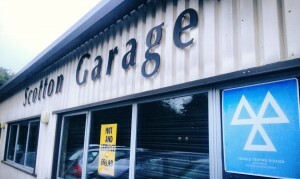 Scotton Garage will also undertake any servicing work. We offer a range of services from a simple oil change service to a full service (including oil filter, fuel filter, air filter, pollen filter, oil change, spark plugs and brakes stripping, cleaning and adjusting as well as all of the usual service items). Similarly Scotton Garage undertakes both trade and private MOT's for class 4 vehicles. (cars and vans up to 3 tonnes) Their MOT's are competitively priced as they are one of the biggest testing stations in the area. They are open to private customers and trade for all general repairs, servicing and MOT work, even if your car was not purchased from ourselves. Call Scotton Garage for more info. Scotton Garage undertake jobs on all makes and models of vehicles including cars, vans, motorbikes and quadbikes. If you have a problem, they will fix it. No job too big or small. Jobs range daily from engine changes to bulb changes. Some of Scotton Garages other areas of work include repair or replacement of suspension components, clutches and gearboxes, exhausts, air conditioning, tyres, batteries, wiper blades, wiring, electrics, digital diagnosis using the latest diagnostic equipment and restoration work to name but a few. They often break cars for parts so they may even have cheaper, pre-loved parts available.